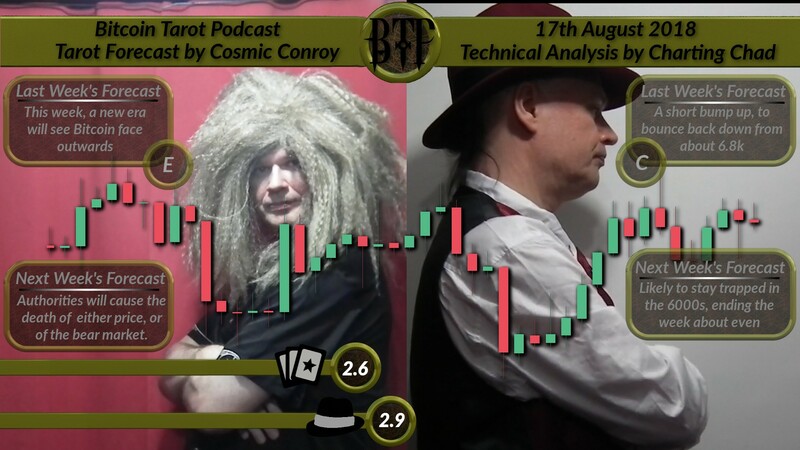 Cosmic Conroy feels like he’s losing control in this week’s new look faster paced #Bitcoin #Tarot #Podcast, but still reads the cards and suggests the authorities may cause the death of the price, or of the bear market. Will Charting Chad’s analysis give us anything more definite? Brand new look for this week’s show which extended editing time by a good hour and rendering time by another hour. Awesome new introduction though, fancy new info-graphics. All good stuff. You should totally watch. [Tarot-Synopsis] Authorities will cause the death of either price or of the bear market. [TA-Synopsis] Stay trapped in the 6000s, ending the week about even.